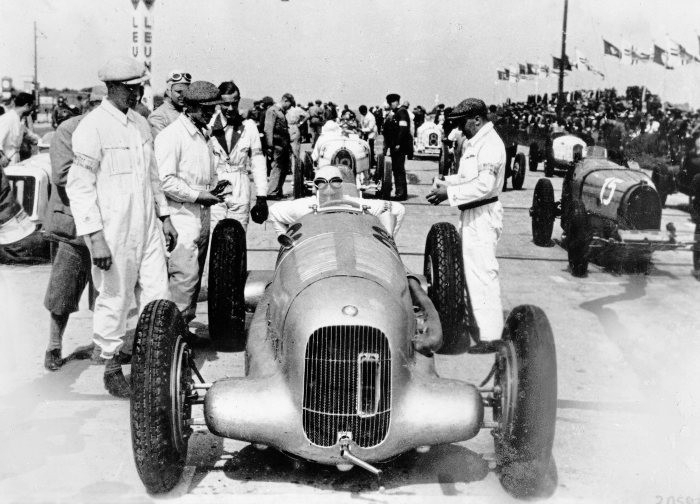 Hermann Lang in the Mercedes-Benz 3-litre Source: © 2019 Daimler AG. All rights reserved. Source: © 2019 Daimler AG. All rights reserved. USPA NEWS - Formula 1 is regarded as the premier class of motorsport. 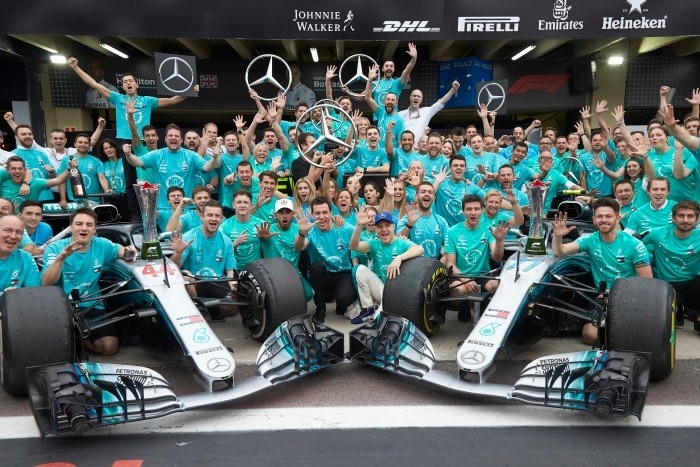 Mercedes-Benz is one of the most successful brands ever in this racing series, most recently in 2018 with the fourth World Championship going to Lewis Hamilton with Mercedes-AMG Petronas Motorsport as well as the fifth consecutive constructor's title and driver's title. This anniversary newsletter summarizes the history of the involvement. On 17 March 2019, the new Formula 1 season kicks off with the Australian Grand Prix in Melbourne. 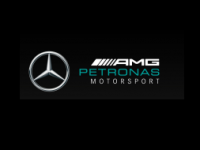 Mercedes-AMG Petronas Motorsport will once again be competing with two cars and drivers ─ Lewis Hamilton and Valtteri Bottas ─ to continue an unprecedented series of successes. From 2014 to 2018, the team has won five drivers' world championships and five constructors' world championships in a row. One could say that the will to compete is in the genes of the brand. Daimler engines lay the foundation for success at the world's first automotive race held from Paris to Rouen in 1894. Other important triumphs soon follow. Even after the turn of the century, predecessor brands Benz and Mercedes and ─ as of 1926 ─ the Mercedes-Benz brand continue to dominate the international racing scene. 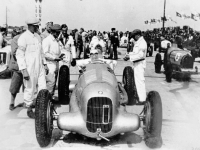 The years spanning from 1934 to 1939 are a brilliant epoch in European motorsport while also representing an outstanding era in the motorsport history of Mercedes-Benz as the silver arrows from Stuttgart keep on winning prominent European races. At this time, Mercedes-Benz wins three European Championship titles, which are comparable to today's Formula 1 World Championship titles. Numerous other racing victories and sensational records are also racked up. Formula 1 as defined by the FIA (Fédération Internationale de l'Automobile) is first held as an official sporting event in 1950 and continues the tradition of the European Grand Prix Championship. Mercedes-Benz is still busy trying to revitalize its business after the Second World War but follows the events very closely. The brand is looking to regain success in international motorsport as quickly as possible and tests the competitiveness of the pre-war W 154 at two races in Argentina in 1951. Securing two second places, it does quite well, although the fast, yet heavy vehicle is no longer capable of winning in the current racing environment. The Stuttgart-based firm chooses a pragmatic but very successful path toward launching a new beginning as the 300 SL racing sports car (W 194) is developed for the 1952 season based on the new 300 passenger car (W 186). It becomes the dominant vehicle of the season ─ the only one it ever participates in. 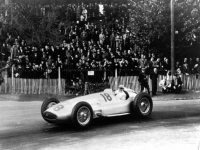 In 1953, Mercedes-Benz is already focusing entirely on entering Formula 1 as of 1954, when the new regulations stipulating a maximum displacement of 2.5 litres go into force. The new W 196 R racing car is created for this purpose. And it meets all expectations. 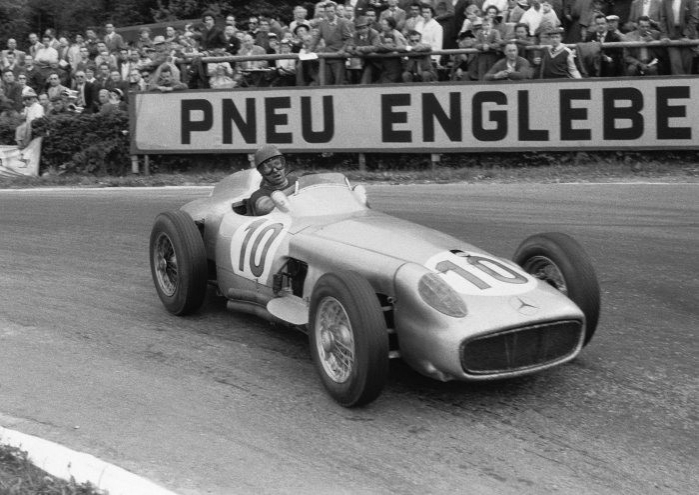 In the car's very first race ─ the French Grand Prix on 4 July 1954 in Rheims ─ Juan Manuel Fangio and Karl Kling take a one-two finish. 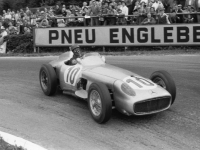 The winning streak continues, and at the end of this premiere season, Fangio is Formula 1 World Champion. With the more advanced Grand Prix car and the 300 SLR racer (W 196 S) based on it, the racing division embarks on a "double hunt" in 1955. After all, Mercedes-Benz is looking to repeat its title win in Grand Prix sport as well as score points in the World Sportscar Championship. And the work pays off as Fangio once again becomes Formula 1 World Champion, while Stirling Moss wins the runner-up title. The brand also wins the World Sportscar Championship as well as the European Rally Championship. At the height of its racing success, Mercedes-Benz withdraws from motorsport at the end of 1955 in order to focus on expanding its range of production cars. 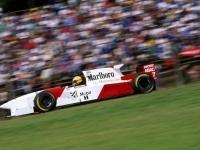 Following numerous endurance race and rally wins, the brand does not return to the racetrack until the 1980s, when it hits the tarmac with racing and touring cars. The successes achieved in the World Sportscar Championship, German Touring Car Championship and German Touring Car Masters (DTM) from 1988 to 2018 are nothing short of outstanding. In 1994, Mercedes-Benz returns to Formula 1 with its Sauber-Mercedes (1994) and McLaren-Mercedes (1995 and later) teams. 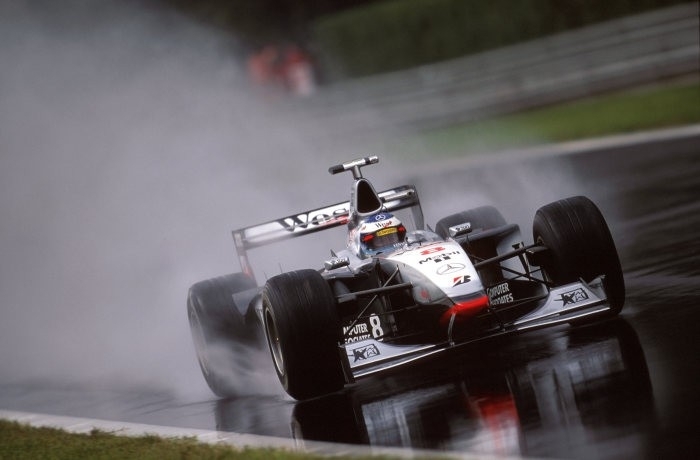 During this time, Mika Häkkinen wins two (1998 and 1999) and Lewis Hamilton one world championship title (2008). 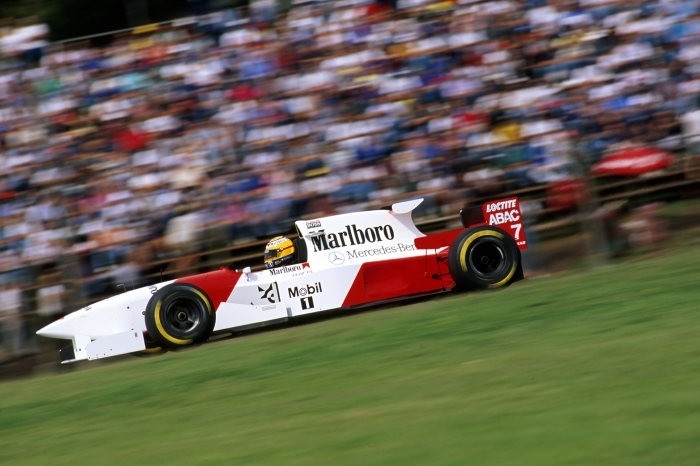 The West-McLaren-Mercedes team also becomes the 1998 Constructors' Champion. This is supplemented by being runners up ten times. A new era comes into view in 2010, when Mercedes-Benz returns to Formula 1 with its own works team and signs on top driver Michael Schumacher, who is replaced by Lewis Hamilton after his retirement in the 2013 season, as well as Nico Rosberg. In 2008, Hamilton becomes the youngest world champion in Formula 1's history at just 23 years of age. From 2010 to 2012, he stands centre stage on the podium of a Grand Prix race no fewer than ten times. 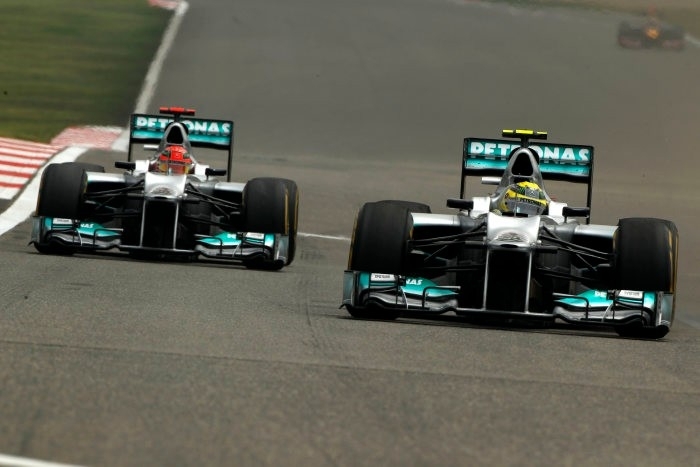 Nico Rosberg celebrates his first GP victory with a Silver Arrow at the race in Shanghai in 2012 while also claiming the first victory for Mercedes-AMG Petronas Motorsport. As the 2013 season draws to a close, the works team second place in the Constructors' Championship. 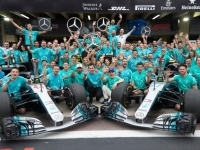 The 2014 season marks the beginning of another golden age for the Silver Arrows as the team goes on to win five World Championship one-two victories in a row: from 2014 to 2018, Mercedes-AMG Petronas Motorsport is the Formula 1 Constructors' World Champion. 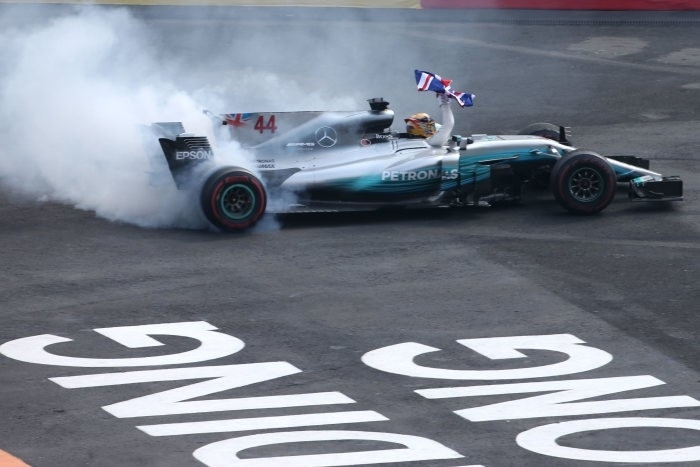 The driver's titles are won a total of four times by Lewis Hamilton (2014, 2015, 2017 and 2018) and once by Nico Rosberg (2016). 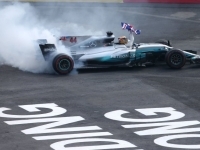 This is added to by three runner-up titles in the Drivers' Championship won by Nico Rosberg (2014 and 2015) and Lewis Hamilton (2016), and a third-place title won by Valtteri Bottas (2017). 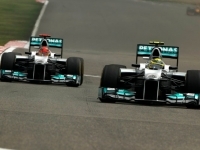 With this brilliant record, Mercedes-Benz has become one of the most successful brands in Formula 1. Active involvement in the Formula E racing programme for battery-powered racing cars ─ which is scheduled to begin at the end of 2019 ─ also follows on from this. As such, this marks the beginning of a new era as motorsport forms an essential component of the Mercedes-Benz DNA. Liability for this article lies with the author, who also holds the copyright. Editorial content from USPA may be quoted on other websites as long as the quote comprises no more than 5% of the entire text, is marked as such and the source is named (via hyperlink).